It's very interesting to read about all the SmartPhone diagnostic tools. I am quite new to the whole topic, but have already tested a range of apps for the iPhone for my tremor. I think it's easy to use and it has instructions that can help. So i am curious what you think is best. Thanks for posting the info. I only briefly looked at TremorTest when I was looking around and saw the one screen shot of the hand holding the phone in a horizontal position. 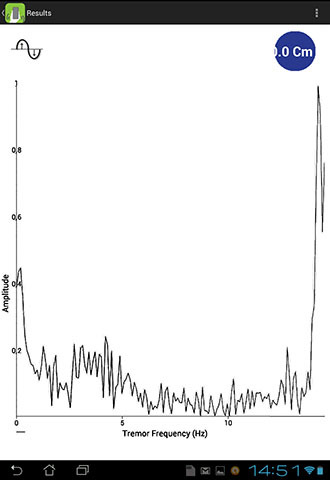 I thought that this might imply that it wasn't reading all of the axes XYZ ? Did it work well in a vertical position, such as on a leg? The more I read about this, the more exciting it sounds. Jeff, you are doing an excellent job getting information out to us. I guess it's up to the patients to use it or to tell the doctor in this case. it works great for any position, since it is reading all axis. This is also stated in the description. So the picture is just a bit misleading. Like several of you, I do not have a smartphone either. But guess what? I do have a web tablet. It has the Android operating system and a built in accelerometer. I downloaded the LiftPulse app (free) and installed it on the web tablet. Strapped the web tablet to my wife's leg (she does not have OT) in order to get the baseline, or control reading. Then I strapped the web tablet to the calf muscle on my right leg using an ordinary pants belt, punched the start button on the LiftPulse app and took my 10 second recording. Against my wife's fairly flat recording, mine produced a startling huge spike at about 14 - 15 Hz on the right hand edge where it got cut off by the LiftPulse present upper limit of 15 Hz. Pretty dang impressive. first time in about 18 years of having this disorder that I have been able to "see" what is going on down there with my jitterbug legs. I also figured out how to take a screen shot of the tremor chart so that I can share it with others - maybe even you guys, if Jeff agrees. People on TV are always saying when they show you something awesome, "Don't try this at home". So yes, this is something you can "try this at home". NOTE: As mentioned above if the tremor is above the threshold of the 15Hz limit of the LiftPulse App the will not show the tremor on the graph. Currently there are other apps that do show a range above 15Hz and hopefully in the future LiftPulse will also include this range to include OT. Here's an interesting chart showing the range of disorders and the frequency of the tremors. OT is the only tremor listed that is >12Hz, which is why measuring the frequency might be very important in a diagnosis. Last edited by Abinadi on Mon Apr 01, 2013 10:11 pm, edited 3 times in total. Our investigative reporter is back on the job! Sounds like you had great success. I'm traveling for a couple days but I will send you a message with info on posting the screen captures and/or instructional photos as soon as I return. It must have been exciting to actually see your tremors on your web tablet. When I was diagnosed in 2002, I was able to see my tremors on a screen at the neurologists office. I had quite a few tests done and the "spikes" were very high. As I said earlier, we don't have a smartphone, but I may try to find someone who does have one and take the advice Jeff gave me; ask if they will download the free app to their phone so I might see my tremors now. I am waiting for the new app which will allow us to HEAR our tremors. Jeff, I will be waiting to see what you put on this site for Rich, so we can all see what he did. This is all so exciting to me. 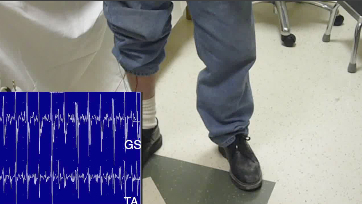 Orthostatic tremor is rare, and the characteristic high frequency can make it difficult to visualize or palpate; diagnosis often depends on tremor analysis.1 A unique feature is the sound resembling a distant helicopter during auscultation over the thigh or calf.2 This “helicopter sign” can also apply to the sound generated during surface EMG of affected muscles. Rich, is your web tablet the same thing as an iPad? We do have one of those. Thank you so much for sharing your experience testing the calf of your wife and your calf. I tried to access the links you added in your post, but it wasn't an active link. I will try to copy and paste it unless you can make it an active link for all. I think....if you go back and edit, if you place your cursor at the end of the link and hit "enter" it should make it an active link. That is what I usually do; but Jeff would be better able to explain it better than I. Also, Jeff....thank you so much for putting the link Neurology.org for the article and especially for the link to the Neurology.org website so we can actually see and HEAR what our tremors sound like; it was an emotional thing for me and brought tears to my eyes. Now, when this is available to all of us, we can SHOW people what we are experiencing and perhaps it will help others to understand what we deal with on a daily basis. Thank you Rich and thank you Jeff! This app will work with a range of frequencies that cover OT whereas the LiftPulse will only display the tremor if your's is 15Hz or below. Thank you so much for the information; you ALWAYS come through for me as well as many others. I am on my computer now, but I will work on my iPad a little later and hopefully will be able to get the apps on my iPad. I am so eager to try this; as I said, this is VERY exciting to me. I will let you know how I do. Again....thank you so much for all your help. Thank you for posting the article with accompanying video. Can't wait to show it to my husband and some family and friends so that they may understand a little more what I mean when I say my legs are "going". Rich, is your web tablet the same thing as an iPad? Essentially the same concept, but better. Why is it better? Because its mine. Mine is made by Asus and runs on an Android operating system (software) instead of iOS, as the Apple iPad does. But seriously, they are both just web tablets. Apple at first did this concept better and bigger and the iPad gained traction among the public. It is sort of like all tissue paper ended up being referred to as Kleenex. Many tissues are actually as good and many are even better than Kleenex, but somehow they end up being called Kleenex. But because the two types of web tablets (and smartphones too) operate on different software, you must get the app (a program that is used for a particular application) that will work on your type of Kleenex - er, iPad, er, oops, I mean web tablet. Did I confuse the issue enough for you? You do have a great sense of humor, something we all need. 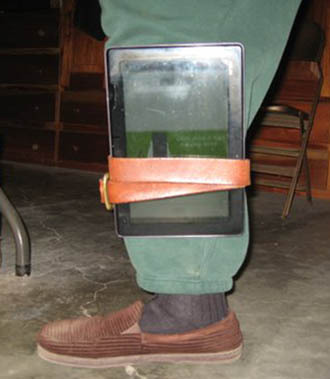 Now...as to whether your "web tablet" is better than mine; that may be up for discussion! Actually, I am not that tech savvy, so I must depend on Jeff to set me straight. I do have an iPad; printed out the information Jeff put on this site and am working on getting things set up so I can "see" and "hear" my tremors. I find all this so very exciting! I do all my "chatting" sitting as well; I think many of us do. Hi Gloria: Always good to see you jumping in with your comments. I know you check this site, probably daily.